(battery eliminator circuit) down to 5.2 volts. This allows an external 6 volt BEC to be used with Futaba servo models 9241. 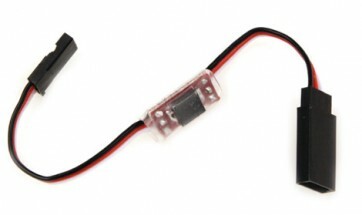 9251.
plugs and is ideally used in series with the RC model's gyro and rudder servo to prevent any harmful damage overloading to your servo. Ultra compact step-down voltage regulator cable to reduce 6V source to a safe 5.2V to the rudder servo. High power component to withstand current of up to 5 Amps continuous, 10 Amps peak at 50V. Prevents harmful damage and overloading to the digital rudder/tail servo.